Robert P. Thompson, manager of engineering - transformers at the Line Material Industries plant here, has been promoted to manager of central research and engineering at the Milwaukee plant. Robert A. Hinshaw, now assistant to Thompson, will take over as manager of engineering - transformers. Both promotions, effective May 1, were announced Saturday by R. C. Kirk, vice president in charge of research and engineering for Line Material. Thompson, in his new capacity, will direct engineering and development activities on power capacitators [sic], voltage regulators, construction materials, protective equipment and outdoor lighting. These products are manufactured in plants in South Milwaukee, Olean, N. Y., East Stroudsburg, Pa., Birmingham, Ala., Sherman, Tex. and Barton, Wis. In addition, he will manage the new research facilities and laboratories at Franksville, Wis.
Thompson is a native of Zanesville and a graduate of Zanesville High School. He received his bachelor's degree in Electrical engineering at Ohio State University. He worked at Babcock and Wilcox in Barberton after graduation, joining Line Material in Zanesville in 1941 as an electrical design engineer. He later served as chief electrical design engineer, assistant chief engineer and has been manager of engineering - transformers since January, 1955. Thompson is a member of the Kiwanis Club of Greater Zanesville, Chamber of Commerce, Ohio Society of Professional Engineers, American Management Association, Ohio State University Association and the American Institute of Electrical Engineers. He resides at 491 Longview avenue with his wife, Virginia, and their daughter, Linda Ann. Hinshaw, in his new position as manager of engineering - transformers, will direct all product engineering and development activities on transformers at the Zanesville plant. A native of Akron, he received a bachelor of arts degree in physics at Duke University and a master's degree in physics at Ohio State. He previously worked in the research department of Goodyear Tire & Rubber Company in Akron. He was head of the Department of Physics at Muskingum College before joining Line Material in 1953 as a laboratory engineer. He was appointed chief laboratory engineer in 1955 and assistant to manager of engineering - transformers in 1958. Hinshaw is a member of the Rotary Club, the Masonic Lodge, American Physical Society, American Acoustical Society, American Management Association and American Institute of Electrical Engineers. He lives on Bloomfield road, New Concord, with his wife, Ann, and their four daughters, Patricia, Deborah, Gale and Rita. SPRINGFIELD, Ohio -- Heaven became an even more beautiful place on Saturday, July 19th, 2014 with the passing of Robert Alonzo Hinshaw at the age of 91. Robert was born in Akron, Summit County, Ohio on January 15th, 1923, the only child of George Knight and Hazel Phares Hinshaw. At the time of his death he was the oldest living Past Grand Master of Masons in Ohio. On February 26th, 1944 he was married to Ann Elizabeth Jones of Akron, Ohio. In September of 1947 he assumed the chairmanship of the Physics Department at Muskingum College in New Concord, Ohio; a position he held along with the chairman of the Science Division of the college until June of 1953. He then became a member of the engineering management team at the McGraw Edison Company in Zanesville, Ohio before becoming Manager of Manufacturing Operations. He was made a Master Mason in Concord Lodge No. 688 F&AM on January 29th, 1949 and served as Master during 1953. He was created an Honorary Member of the Supreme Council 33 Degree Masons in Chicago, Illinois on September 27th, 1961, In the York Rite, he was exalted a Royal Arch Mason in Cambridge Chapter No. 53 on February 13th, 1950, transferring to Horace W. Wright Chapter No. 226 in Worthington, Ohio. He was received as a Royal and Select Master in Guernsey Council No. 74 on March 21, 1950 and was created a Knight Templar in Cambridge Commandery No. 47 on May 6th, 1950. He became a member of the Lodge of Perfection; Council, Princes of Jerusalem; Chapter of the Rose Croix, Ancient and Accepted Scottish Rite in the Valley of Cambridge and of Scioto Consistory A.A.S.R. of the Valley of Columbus in November of 1949 as a member of the Roscoe R. Walcutt class. He became a charter member of Guernsey Consistory in the Valley of Cambridge in September of 1955. He served as Most Wise Master of Cambridge Chapter of Rose Croix in 1958, 1959, and 1960. He served as Comander-in-Chief of Guernsey Consistory from 1972 to 1974 and was chairman of the Executive Committee. Robert served as Sovereign of St. Jerome Conclave, Red Cross of Constantine. He was a past president of the Eighteenth Masonic District Past Grand Masters Association. Robert was a member of the Zavi Shrine Club of Zanesville, Ohio, a member of the Kilwinning Council No. 62, Knight Masons of Ireland and a member of the Royal Order of Scotland. He was also an honorary member of Achbar Grotto. In 1962, he was appointed a Grand Representative of the Grand Lodge of New York. In 1966, he received the Legion of Honor, Order of DeMolay. 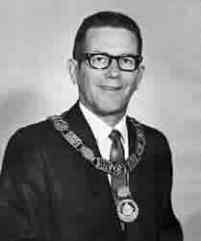 Robert was appointed District Deputy Grand Master in 1956. He was appointed Junior Grand Deacon in 1961 and proceeded through the line whereupon he was elected Grand Master of the Grand Lodge of Ohio in 1968. 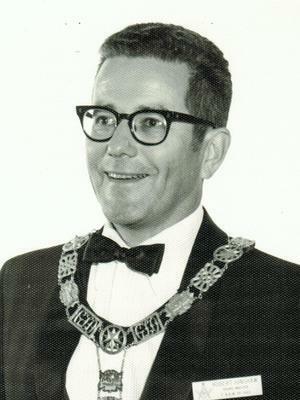 Robert was elected Grand Secretary in Ohio in 1970, a position he held until retiring in 1986 at which time he became Ohio's first Grand Secretary Emeritus. Robert and Ann moved to Brevard, North Carolina for their retirement. Robert joined Dunn's Rock Lodge No.267 in Brevard where he served as Secretary for ten years. In 1993 He was made an Honorary Member of the Grand Lodge of North Carolina with the title of Past Grand Master. Robert was a member of Oasis Shrine and served as Ambassador from 1993 to 1995. Robert's civic activities included the Board of Trustees of College Drive United Presbyterian Church, Board of Directors of Zanesville YMCA, member of the Advisory Board and Director of Development of Good Samaritan Hospital in Zanesville, President of the Zanesville Rotary Club, Board of Directors of the Muskingum Motor Club, Chairman of the pilot campaign for the United Fund of Zanesville, Charter member and Secretary of the Worthington-Dublin Rotary Club, Vice Chair of the transformer section of the National Electrical Manufacturers Association and Chair of the Worthington Development Commission. He held memberships in the American Institute of Electrical and Electronic Engineers and the American Physical Society. In 2014, Robert and Ann moved to the Springfield Masonic Community where he was awarded his 65 year pin. Throughout his life, Robert enjoyed classic automobiles, model railroading and numismatics, and never failed to enjoy the comfort of a good dog or a big bowl of ice cream. Robert is survived by Ann, his wife of seventy years; his daughters, Deborah, Gail, and Rita, and their families which include four grandchildren and two great-grandchildren. He was preceded in death by his daughter, Patricia and his son, George. In keeping with Robert's wishes, a private family service will be held at a later date. Robert will be missed in death as he was loved in life, which is immeasurable. Services are being handled by Farus Funeral Home of New Concord, Ohio. Contribution from Robert Alonzo Hinshaw. "The Times Recorder", Mar 23 1959; http://www.ancestry.com. "The Chronicle Telegram" (Elyria, Ohio), Oct 18 1953; http://www.ancestry.com.